The MNOVC now has a few items for sale in our kit shop. Visit the Kit Shop tab to the left. A new certificate of recognition has been created to honour Veterans of the Korean War on behalf of a grateful nation. 2013 was announced the Year of the Korean War Veteran as it marks the 60th anniversary of the Korean War Armistice. This declaration further supports efforts to recognize Korean War Veterans. Canada’s military members have always distinguished themselves. They deserve their place among the world’s best and the men and women who served during the Korean War-or in the years afterward, keeping the peace between the two Koreas-did so with courage and conviction. The Government of Canada is proud of what these remarkable Canadians accomplished. The Certificate of Recognition is a lasting reminder of the important contributions Canadian Veterans of the Korean War made to the peace and security we all enjoy today. Canada must never forget that more than 26,000 Canadians traveled halfway around the world to stand up for their rights. Nor should we forget the 516 Canadians who paid the price for freedom with their lives. Canadian Veterans of the Korean War can now apply for a special certificate of recognition. Please contact the Department at 1-866-522-2122 or apply online. The MNOVC Executives have appointed their new Veteran’s Senator, Dr. Alis Kennedy CD, OMC, PhD to the position of Veteran’s Senator. Veteran/Senator Kennedy brings much experience to the MNOVC Council. She has served as MNO Senator for the Credit River Métis Council and the Toronto and York Region Métis Council for several years. Being very active in her home community of Toronto GTA, she also sits on several local, provincial and national committees and is a member of a local branch of the Royal Canadian Legion. The swearing in Ceremony took place at the MNOVC meeting held in Ajax on June 30, 2013. We welcome Senator Veteran Dr. Alis Kennedy CD, OMC to her new position with the Métis Nation of Ontario Veterans Council. Being a verified Métis under the MNO definition and having been verified as a Veteran by the Métis Nation of Ontario Veterans Council (MNOVC) per the Veterans Charter Agreement, subscribes to the bylaws, policies and regulations established by the Métis Nation of Ontario Veterans Council Community Code and through the established Veterans Charter from the Métis Nation of Ontario shall work towards the betterment of the MNOVC Council and its Veteranship , the soul representative council of the MNO Veterans in the Province of Ontario. 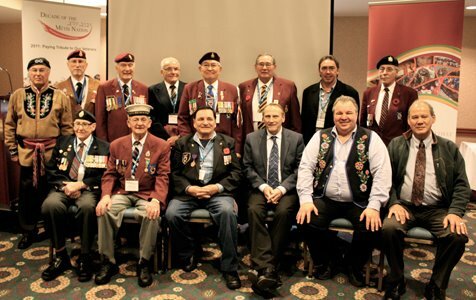 The Métis Nation of Ontario (MNO) Veterans’ Council is putting increased emphasis on communicating its message about the importance of veterans within the Métis Nation. 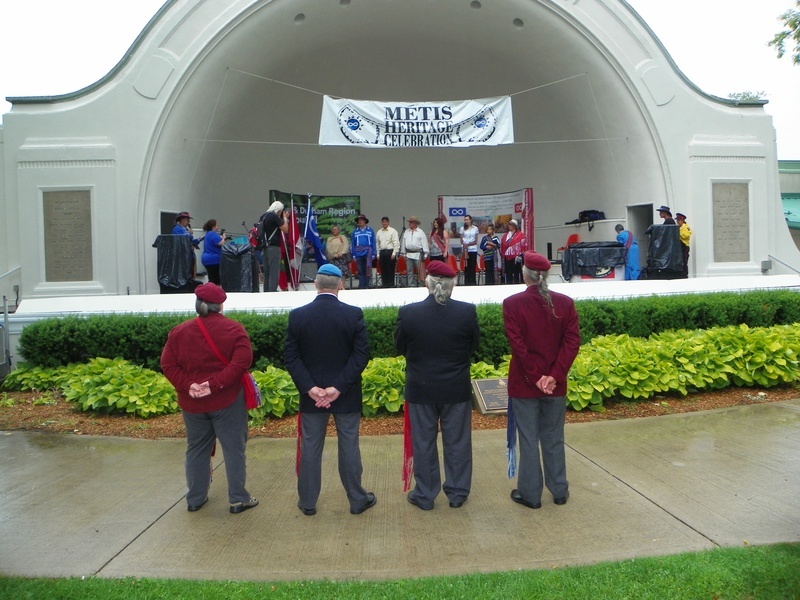 In keeping with that emphasis, the MNO Veterans’ Council was well represented at the Oshawa Métis Heritage Celebration held in June 22-23, 2013. For the first time, the MNO Veterans’ Council had an information booth and promoted the MNO Veterans’ Book project. The information booth helped raise awareness of the MNO veterans. Registration forms, Veterans’ Book project interview packages and various veterans’ resources were on hand. The 1,500 plus who attended the event were very interested in the MNO Veterans’ Council program.Pins donated by Veterans Affairs were handed out to all who visited. The veterans were asked to be part of the grand entry and post the flags of the day. At the end of the day, they again responded by properly retiring the flags. Although it rained for half the day, it did not deter the veterans from their duty. Senator Dr. Alis Kennedy, CD, OMC, at the MNO Toronto and York Region Métis Council AGM. 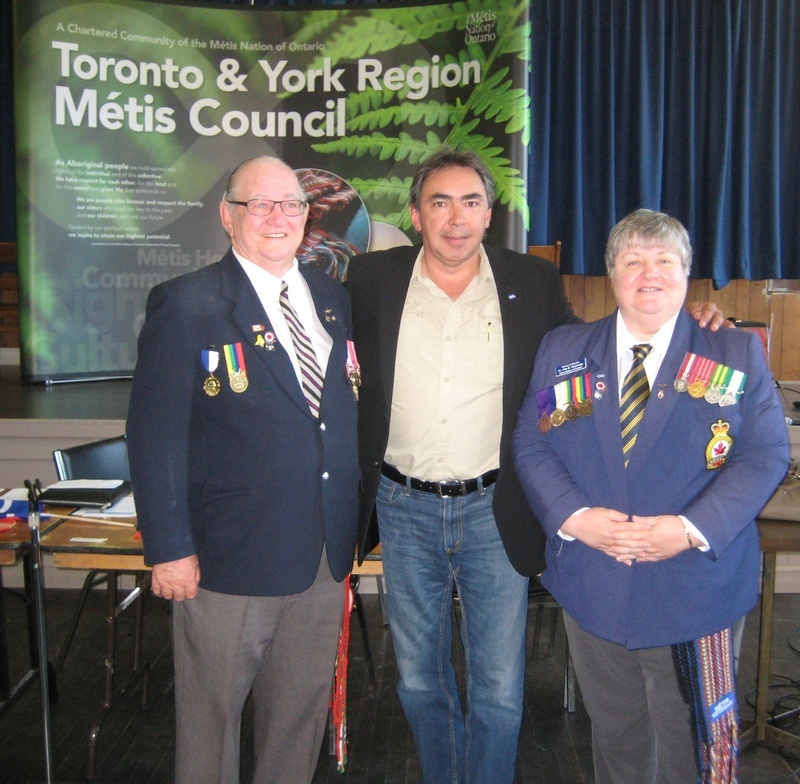 Métis Nation of Ontario (MNO) Toronto-York Region Métis Council hosted their Annual General Meeting (AGM) on June 9 at the local Royal Canadian Legion. President Gary Lipinski was in attendance and presented the MNO Louis Riel Commemorative Medal and the MNO Louis Riel Certificate to MNO Veteran Harvey Horlock, C.D.. Veteran Horlock has been heavily involved with the MNO for many years. He is a past president and a past Senator of the MNO Toronto-York Region Métis Council and past president of the MNO Veterans’ Council. He also assisted in the creation of the MNO Oshawa Durham Métis Council and the MNO Credit River Métis Council. 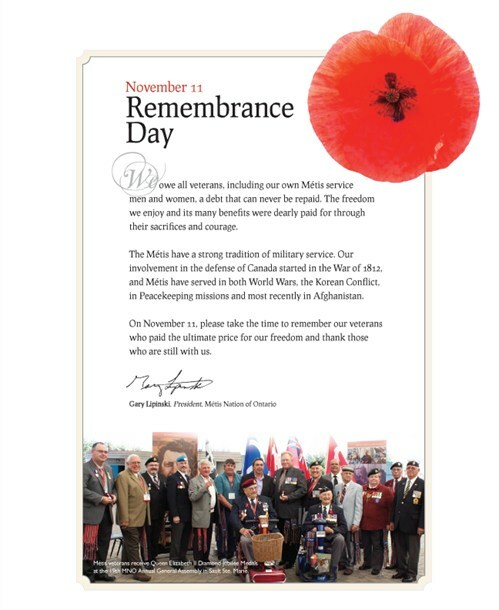 For the past several years, Veteran Horlock has represented the Métis Veterans at the Oshwegan National Memoriam Day and for the past two years he has been invited by the Premier’s Office to represent the MNO at the Remembrance Day ceremony in Queen’s Park. Currently, Veteran Horlock is the president of the Toronto Scottish Regiment, a member of the Royal Canadian Legion Todmorden Branch number 10 and a member of their colour party, being so; he has participated in the Louis Riel Day colour party at Queen’s Park. Opportunity for Veterans to be with other Veterans in a outdoor setting. The Métis Nation of Ontario (MNO) Veterans Council presents Louis Riel certificates to MNO citizens who provide the Council with documentation verifying their military service. Recently the MNO Veterans Council received the documentation from MNO citizen and Veteran Peter Grisdale. 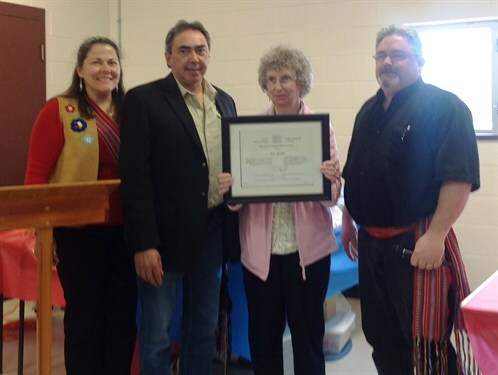 Although Veteran Grisdale was not able to attend a presentation of the certificate personally, at the MNO Moon River Métis Council Annual General Meeting in MacTier on April 23, his sister Emily Arnold, was able to accept the certificate on his behalf. The certificate was presented by MNO President Gary Lipinski, MNO Moon River Métis Council President Lisa McCron and MNO Veterans Council Sergeant-at-Arms Greg Garratt. MNO Veteran Shelly Claus CD, carried the Eagle Staff during the 2012 Remembrence Day parade in Windsor. Quite the Honour. Shown above are her two sisters. From left ti right: Donna O'Neil, Veteran Shelly Claus and Veteran Sharlene Lance. MNO Veteran Peter Gendron receives the Louis Riel Certificate from the Great Lakes Metis Council President. 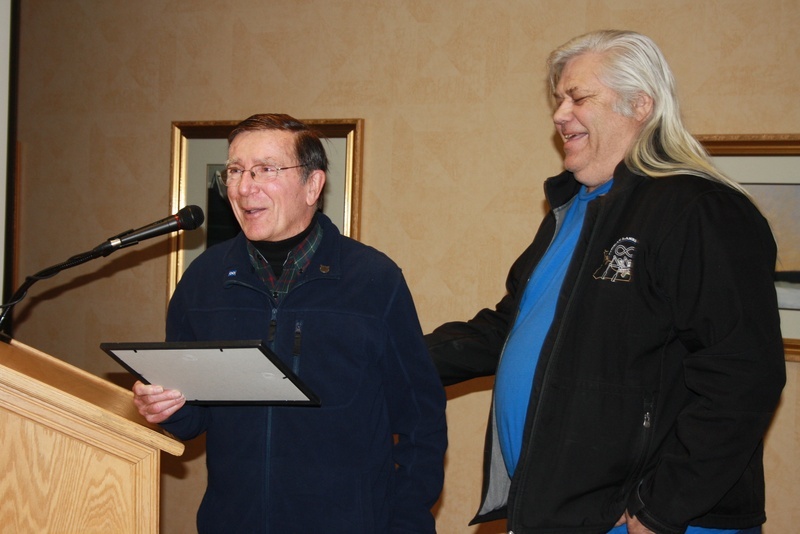 The Great Lakes Metis Council President Peter Coture presented the Louis Riel Certificate to Veteran Peter Gendrn at their latest AGA IN Owen Sound. While vacationing in Florida with his wife Carmen, MNOVC Senator, Veteran George Kelly passed away on Friday, March 1st 2013. George joined the Royal Canadian Navy at the age of 17 and served from 1952 until honourably discharged in 1957. During his five year career, he served on the High Seas with NATO COMMAND. During the Korean Conflict, he served on board, the H.M.C.S. SIOUX, the H.M.C.S. ATHABASKAN and the H.M.C.S. ALGONQUIN. George was well known for wearing his “original issue” Naval “flat top hat”. He was so proud of his “white pancake”. George joined the MNOVC executive as the Senator for the MNO Veterans in June 2012. He was always in the background, advocating for the Veterans. Since joining the MNOVC executives, George offered support to the Veterans Council and established an “open door policy” between the MNO Youths and the Veterans. At last year’s AGA, 2012, George was awarded the Queen’s Diamond Jubilee medal. It was presented by MNO President Gary Lipinski. 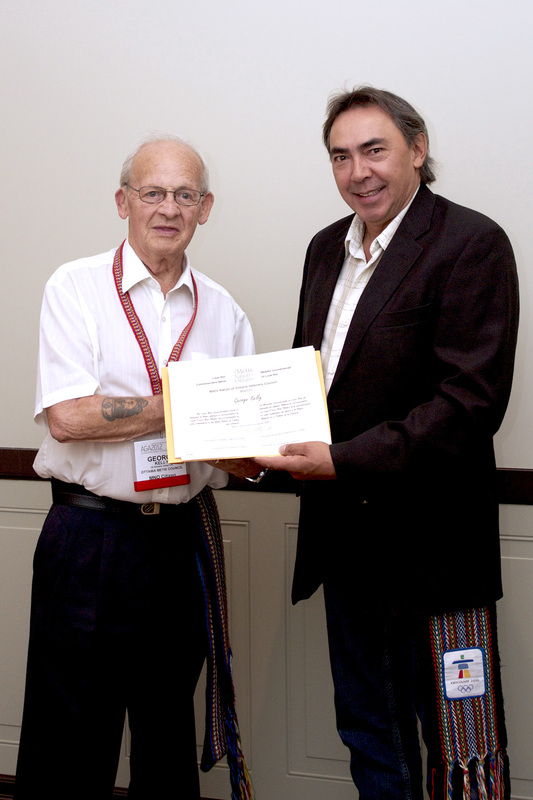 Also at last years AGA, George received the Louis Riel certificate from MNO President Gary Lipinski. 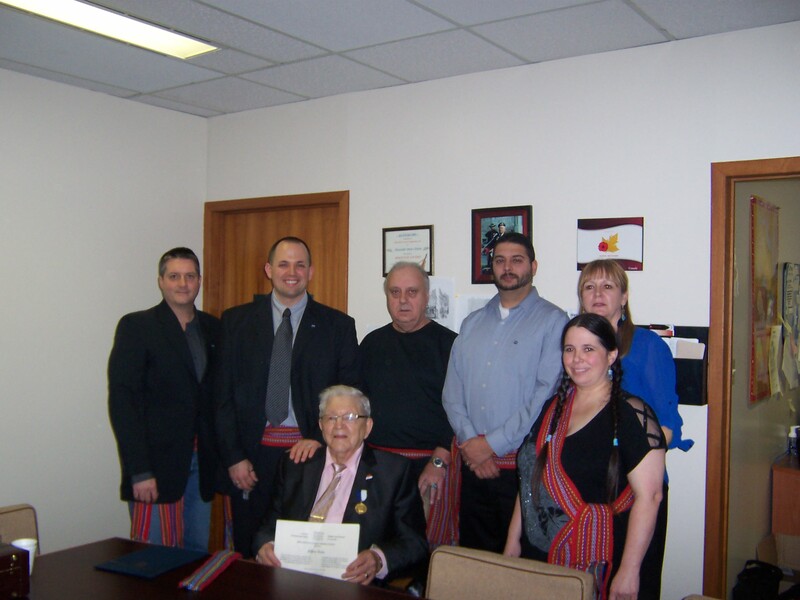 December 11th, 2011, George was honoured by receiving a plaque by the Metis National Council (MNC) in Ottawa. Back in June 2011, George was one of the Veterans from Ontario that attended the Back to Batoche Days in Saskatchewan. Along with other Veterans, George was acknowledged by receiving another plaque. Ottawa Police Department (Special Constable|) 1960 - 1971. City of Ottawa Councilor 1985 - 1991. Volunteer: President/ Executive Member, Coach, Ottawa Youth Minor Sports - 1962 and still involved. Volunteered: Santa Claus, at Community events for 20 years. Played Benefit Hockey with Ottawa Police1970 – 1980, for children with special needs. Humanitarian Award For Dedicated Unselfish Service. (This is the Highest Award presented to a community volunteer, by a service club). Attended in 1994 - MNO Founding AGA Meeting in Toronto. George was always about community and his heart was with the Métis Veterans. We will surely miss you George…mon vieu Viau! We are looking at putting together a commemorative Métis Nation of Ontario Veterans’ book, commemorating Veterans, past and present. Past veterans must be genealogically connected to your Métis heritage as per the Métis Nation of Ontario registry process. Present day veterans must be a MNO registered citizen. Métis Nation of Ontario (MNO) veteran, Donn Fowler, recently received the Queen Elizabeth II, Diamond Jubilee Medal during a ceremony held in Brockville, Ontario. The Honourable Senator, Robert W. Runciman, on behalf of His Excellency the Right Honourable David Johnston, Governor General of Canada, made the presentation. Local Métis Veteran receives Louis Riel medal and certificate. On January 9th, 2013, the Windsor-Essex-Kent Métis Council held ceremonies at their local Métis office. The presentation of the Louis Riel medal and Certificate was awarded to Veteran/Councilor Wilfred Rochon who served during WWII. Mr. Eddie Francis, Mayor of Windsor, issued a beautiful letter to the recipient of the Louis Riel medal and was read by City Councilor Ron Jones. 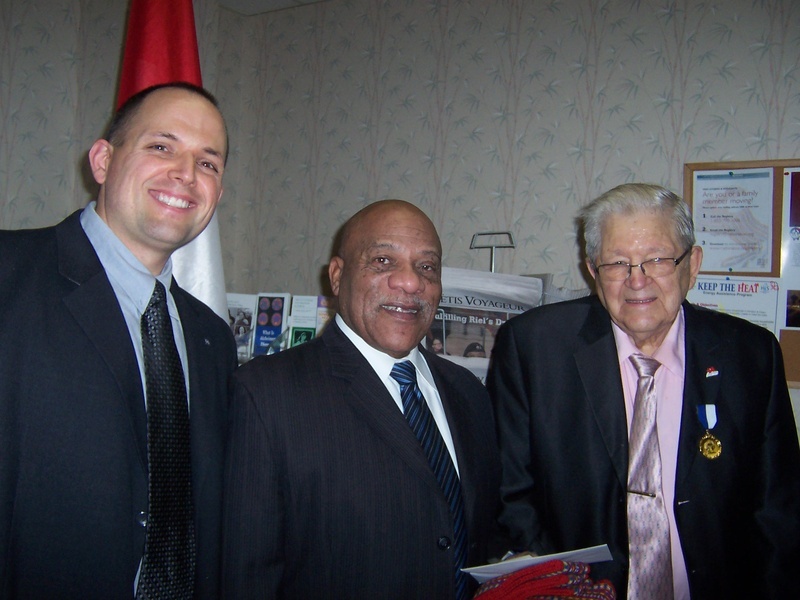 From left to right:Vice President of the Windsor-Essex-Kent Metis Council, City Councilor Ron Jones and Veteran/Councilor Wilfred Rochon. On behalf of the MNOVC, we thank the Mayor of Windsor, the City Councilor, the Windsor-Essex-Kent Métis Council and their community for supporting our Veterans. Local Métis Veterans receive Louis Riel medal and certificate. From left to right: President Andy Dufrane, Veteran Joseph Gagnon WWII, Veteran David Gagnon and Senator Terry Bloom. 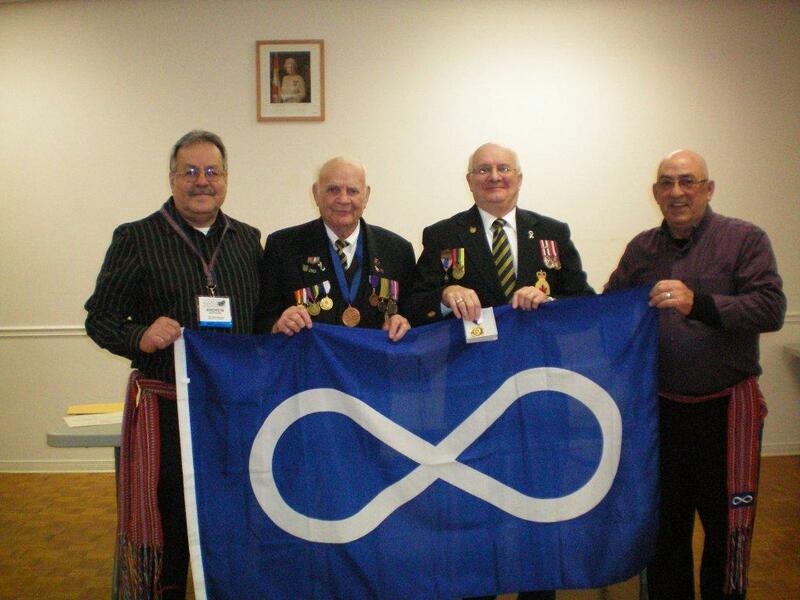 The Peterborough Wapiti Métis Council recently held an award ceremony on December 18, 2012, at the local Royal Canadian Legion Branch for MNO Veterans Joseph Gagnon, WWII and his son, Veteran David Gagnon. Veteran David Gagnon received the Louis Riel medal and certificate and his father, Joseph Gagnon, a WWII Veteran received the Louis Riel certificate. Council President, Andy Dufrane and Senator Terry Bloom conducted the ceremonies. The MNOVC congratulates both Veteran Joseph Gagnon WWII and Veteran David Gagnon for their military service to this great country, Canada. We thank the Peterborough Wapiti Métis Council and Community for supporting our Veterans. Also visit the Photos tab on the left. Gravelle. Every year on November 11, Métis from across the homeland participate in Remembrance Day Ceremonies. Being part of these ceremonies is very important to Métis because we have contributed to the defense of Canada as far back as the War of 1812 as well as both World Wars, the Korean Conflict, peacekeeping missions and most recently, Afghanistan. Over the years, many Métis have served and many have made the ultimate sacrifice. By making the Métis presence felt at Remembrance Day services, we show our respect for all Veterans and we remind all Canadians of Métis service and sacrifices. One such service took place at the Sudbury Arena this November 11 with several Métis Nation of Ontario (MNO) citizens actively participating. The Rev. Steve Callaghan, Métis Veteran and Councilor on the MNO Sudbury Métis Council provided the prayer during the ceremony and a wreath was laid on the Cenotaph on behalf of the MNO by Senator Kempton Gravelle and Gail Charbonneau, Métis Facilitator at Cambrian College in Sudbury. 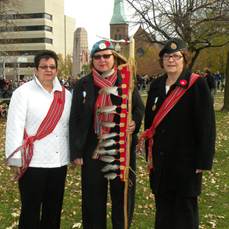 Ceremonies at Queen’s Park on November 11.This year Métis Nation of Ontario (MNO) Veterans Harvey Horlock and Senator Alis Kennedy were invited by the Office of the Premier to attend provincial Remembrance Day Ceremonies at Queen’s Park in Toronto. 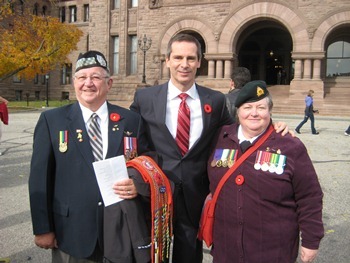 This was Premier McGuinty’s last Remembrance Day as Premier. It was under his leadership that the Veterans’ Memorial Mural was created. Brigadier-General Omer Lavoie, who served in Afghanistan, spoke of how difficult it was to send soldiers to their death and to have to tell their parents and loved ones of their passing. Major-General Richard Rohmer, Canada’s most highly decorated soldier also addressed those in attendance. The participation of MNO veterans like Mr. Horlock and Senator Kennedy in Remembrance Day ceremonies like the one in Toronto is very important to the whole Métis Nation because it reminds all Canadians of the sacrifices the Métis have made and of our long tradition of military service. National Remembrance Day Ceremony. Every year on November 11, Métis from across the homeland participate in Remembrance Day Ceremonies. Being part of these ceremonies is very important to Métis because we have contributed to the defense of Canada as far back as the War of 1812 as well as both World Wars, the Korean Conflict, peacekeeping missions and most recently, Afghanistan. Over the years, many Métis have served and many have made the ultimate sacrifice. By making the Métis presence felt at Remembrance Day services, we show our respect for all Veterans and we remind all Canadians of Métis service and sacrifices. Since 2004, the Métis Nation of Ontario (MNO) has laid a wreath at the National Cenotaph in Ottawa during National Remembrance Day ceremonies. The wreath is laid each year by MNO Executive Senator Reta Gordon and Métis Veteran Shaun Redmond. Senator Reta and Shaun have performed this important gesture on behalf of the MNO in good weather and bad because it is very meaningful on a personal level for both of them, and because it is important to recognize our many Métis Veterans who gave and continue to give so much in securing and sustaining the rights and freedoms that we all enjoy. Each year following protocol, Shaun, as a veteran, presents the MNO wreath to Senator Reta who then lays the wreath on the cenotaph. Senator Reta’s father and her nine uncles all participated in World War II. Then later in the 1950s, her four brothers also served in the military and one of her brothers, Senator George Kelly, even participated in the national Remembrance Day ceremonies this year. “It is good to let everyone know the Métis are here and that we support Remembrance Day,” explained Senator Reta. This year Senator Reta and Shaun also participated in a ceremony at the National Aboriginal Veterans Monument prior to the National Remembrance Day Ceremony. The National Aboriginal Veterans Monument is located a short distance away from the National Cenotaph and is an important symbol of the contributions of Métis and other Aboriginal veterans to Canada. 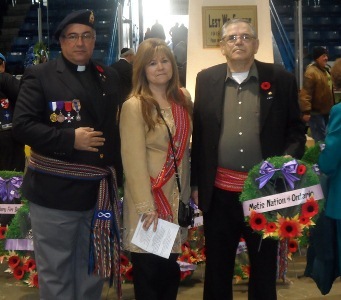 MNO citizens, like Senator Reta and Shaun, who participate in Remembrance Day events are continuing to keep an important tradition vital and alive. It is with great sadness that I learned today that one of our beloved Métis Nation of Ontario (MNO) veterans, Senator Earl Scofield, passed away last night in Windsor. I have had the privilege of knowing Senator Scofield for many years. He was an incredible person and a dedicated Métis citizen who had served the MNO in many capacities. Our thoughts and prayers are with his family. On October 25, Métis Nation of Ontario (MNO) President Gary Lipinski and MNO Veterans’ Council (MNOVC) President Joseph Paquette participated in a ceremony at Rideau Hall in Ottawa that recognized the contributions of Aboriginal peoples to the effort to defend Canada during the War of 1812. During the ceremony, His Excellency, Governor-General David Johnston and Prime Minister Stephen Harper presented Presidents Lipinski and Paquette with a War of 1812 commemorative banner and commemorative medal to acknowledge Métis contributions during the War. These banners and medals were also presented to First Nations groups at the ceremony and in other ceremonies to Canadian military units that participated in the War. Click here to view a video of the entire ceremony. (please note the ceremony is 75 minutes long. If you only wish to view the address by President Lipinski you can place your curser on the video and a progress bar will appear which will indicate how many minutes the video has progressed. By clicking on the bar you can go back and forth in the video. President Lipinski's speech starts at 39:00 and the presentation to the MNO starts at 69:28). Click here for more information on Métis contributions during the War of 1812. On August 27, in a ceremony held at the Annual General Assembly (AGA) of the Métis Nation of Ontario (MNO), 18 MNO citizens received Queen Elizabeth II Diamond Jubilee Medals. The awards were presented by MNO President Gary Lipinski during a special ceremony held at the Roberta Bondar Pavilion in Sault Ste. Marie. Chris Plummer (Courtice), Senator Rene Gravelle (Val Caron), Guy Mandeville (Trenton), Senator George Kelly (Ottawa), Senator Earl Scofield (Lasalle), Senator Elmer Ross (Bobcaygeon), Greg Garrett (Penetanguishene), Kerry McLaughlin (Thunder Bay), Gerry Bedford (Orangeville), Senator Ray Bergie (Brampton), Jean Camirand (Thunder Bay) and Maurice Sarrazin (Val Caron). A total of 64 participants registered for the most recent Black Bear Program held from July 10 to July 14, 2012 at CFB Borden. This camp was special, because it will be the last one in Ontario and because two Métis veterans received Queen’s Diamond Jubilee Medals at the camp. Dr. Alis Kennedy CD, a veteran with the Métis Nation of Ontario Veterans' Council (MNOVC), the National Aboriginal Veterans Association (NAVA) and Senator for the MNO Toronto and York Region Métis Council, and Joseph Paquette, President of the MNOVC, a citizen of the MNO Credit River Métis Council and member of the National Aboriginal Veterans Association, both received the Medal from NAVA Vice-president, Robert Thibeau CD, in recognition for their contributions to the Black Bear Program and the Aboriginal communities. 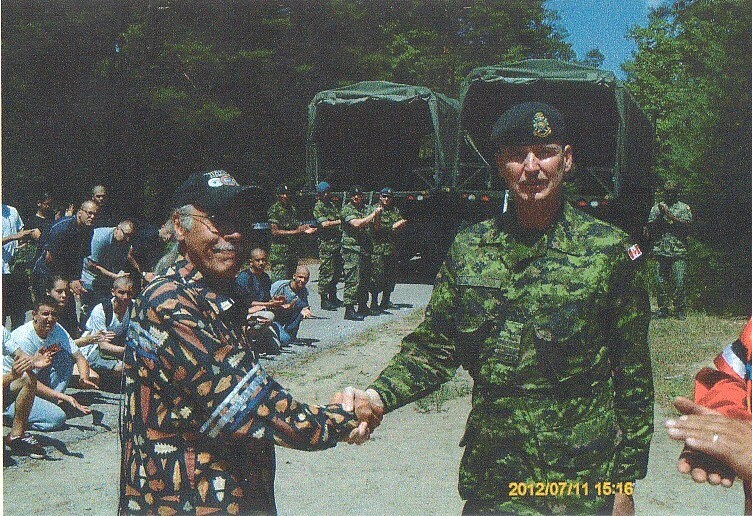 On July 6, 2012, MNO Veterans’ Council President, Joseph Paquette, attended the ceremony marking the change of command at CFB Borden from Brigadier General J.P.L. Meloche, OMM, CD, to Colonel T.L. Harris, CD. Best wishes were conveyed to outgoing Brigadier General Meloche and a Métis sash was presented to incoming Colonel Harris. Under the command of Brigadier General Meloche, CFB Borden hosted the very successful "Aboriginal Youth Black Bear Program" for the past two years. During this time Mr. Paquette participated in the Black Bear Program as the "Métis Elder". This is the last year for the Black Bear Program at CFB Borden, but the program will continue to offer the same opportunities to First Nations, Métis and Inuit youth from across Canada at its new location in Gagetown, New Brunswick. 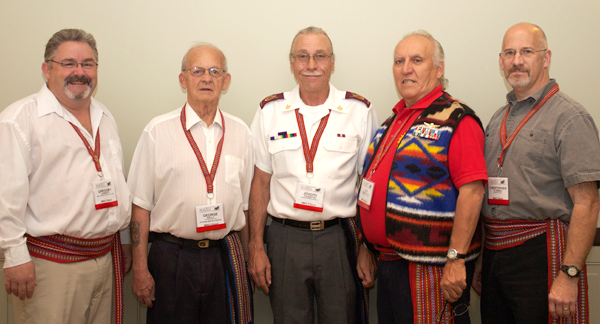 Métis Nation of Ontario (MNO) veterans represented the MNO and the Métis National Council (MNC) in a ceremony at the Fort York Armouries in Toronto on May 22 commemorating combatants who fought on the Canadian side during the War of 1812. Those recognized included Métis and First Nations as well as 31 current regiments of the Canadian Armed Forces that trace their origins to the War of 1812. During the ceremony, the commemorative banner and medal that will be presented to Canadian Forces units and Métis and First Nations communities involved in the War of 1812 was unveiled. This follows the tradition established after the War of 1812, when banners and medals were presented to Aboriginal communities following the end of the War. An 1812 Commemorative Banner and Medal Ceremony for Métis and First Nations communities will take place later in 2012 in Ottawa.